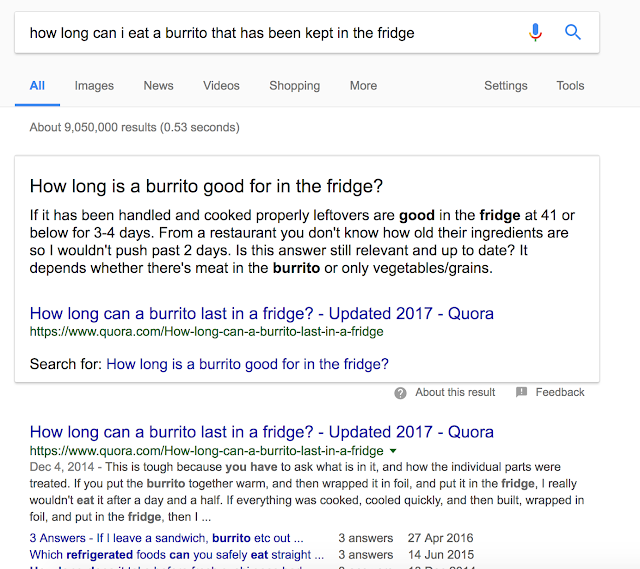 So I just finished eating a chicken burrito that had been in my family's fridge for at least seven days, then realised it tasted a little sour so I Googled it. According to Google results, it was good for 3-4 days. That can't be right, if food only lasts 4 days, what use is having a fridge? One time in high school, I ate an entire pandan chiffon cake that had grown mouldy all over, just so that I could take a medical leave from school. Nothing happened, I didn't feel even the slightest bit queasy so sometimes I'm convinced there's still bacteria from that time in my stomach. My stomach is the best. Unless... one day I have stomach cancer, which would not surprise me because cancer runs in my family. But also: Brooklyn Nine-Nine needs to load, stat. I'm so stoked, there were two episodes released tonight (that means last night but by the time it gets uploaded online it's the next night here, thanks for nothing Singapore)! I'm done with my burrito, I have nothing else to occupy my time. But also also: the new iOS kills me. Why, Apple, why?